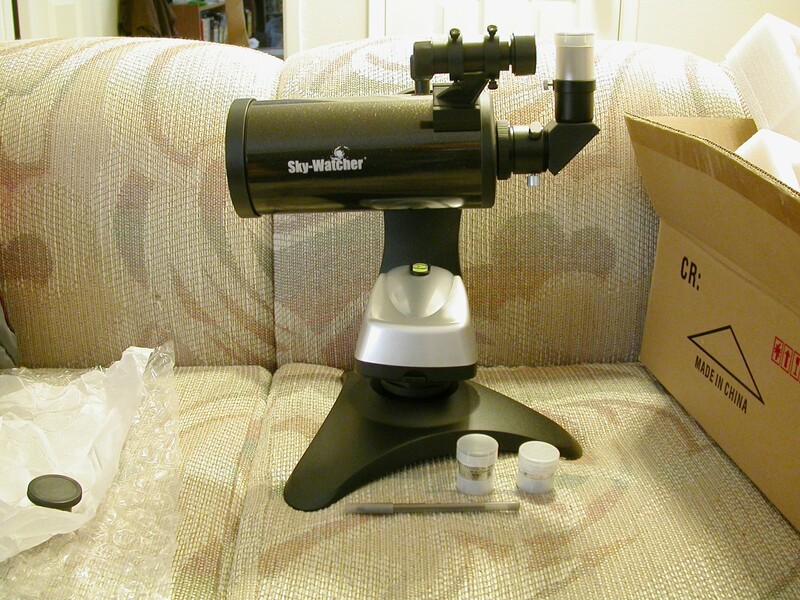 The Sky Watcher 90 mm Backpacker telescope that I ordered last week was delivered today. I wasn’t sure what all to expect in the box–the list of included items on Amazon is maddeningly unformatted and cuts off midstream. I thought I’d do a series of unboxing photos to document what’s in there for anyone who is considering buying this scope while it’s on sale. Inside the usual plain-Jane shipping box is the actual product box with pretty pictures. 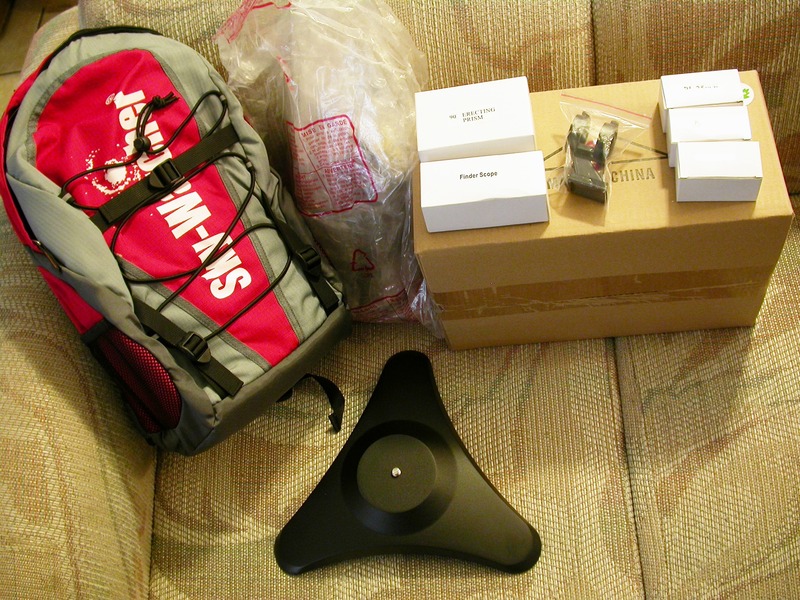 Inside that box are a backpack, the mount base, the warranty, and–yep–another box, all in their own plastic bags. 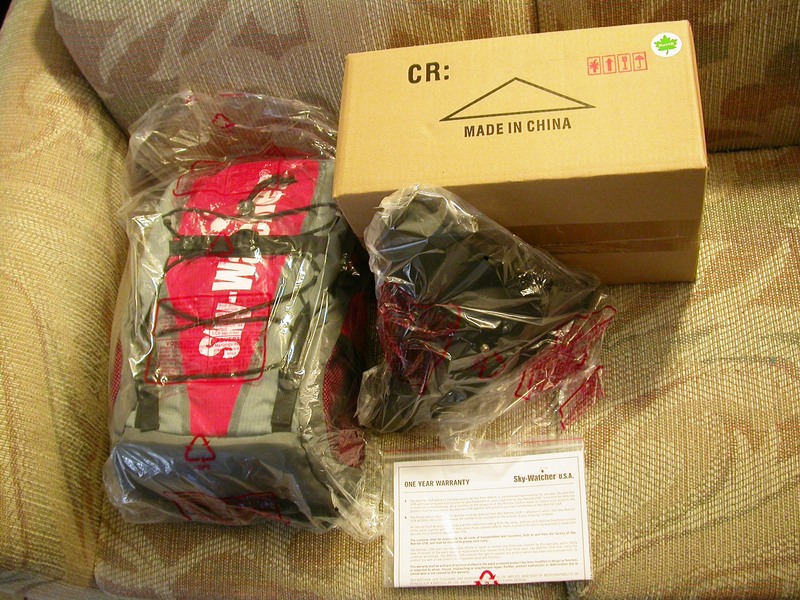 I was expecting to find the mount inside the backpack and the telescope inside the box, but I was wrong. 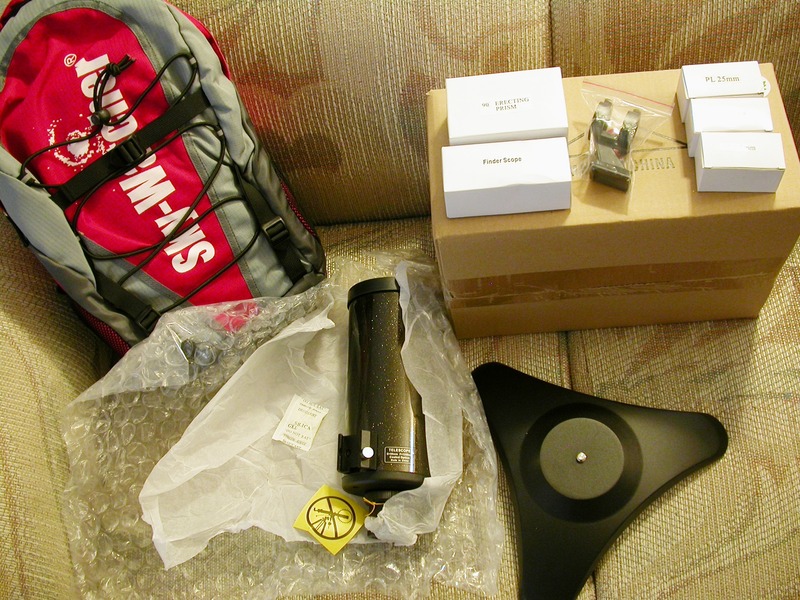 The backpack contained the telescope tube–still swaddled in packing material in this shot–and the smaller boxes containing the accessories. As with all the scopes I’ve bought new recently, the tube was wrapped in tissue paper to protect the finish, then cocooned in bubble wrap, then put in a plastic bag. Note the enclosed silica gel pack and “don’t blind yourself” warning tag. Accessories, left to right: 90-degree prism diagonal (I was hoping for a mirror diagonal), 8×20 optical finder, and eyepieces. The eyepieces are 25mm, 12.5mm, and 6.3mm Plossls, all with silver barrels and stamped “Multi-coated”. The back end of the scope, showing off the finish–which is insanely gorgeous–and the little descriptive plate with the scope’s specs. Note that the meniscus corrector plate up front is coated, not multi-coated or fully multi-coated (these are classes of anti-reflection coatings that improve light transfer through the scope; fully multi-coated is best). Inside the smallest of the nested boxes: the mount, an L-bar adapter, the controller and cables. The L-bar was a nice surprise. 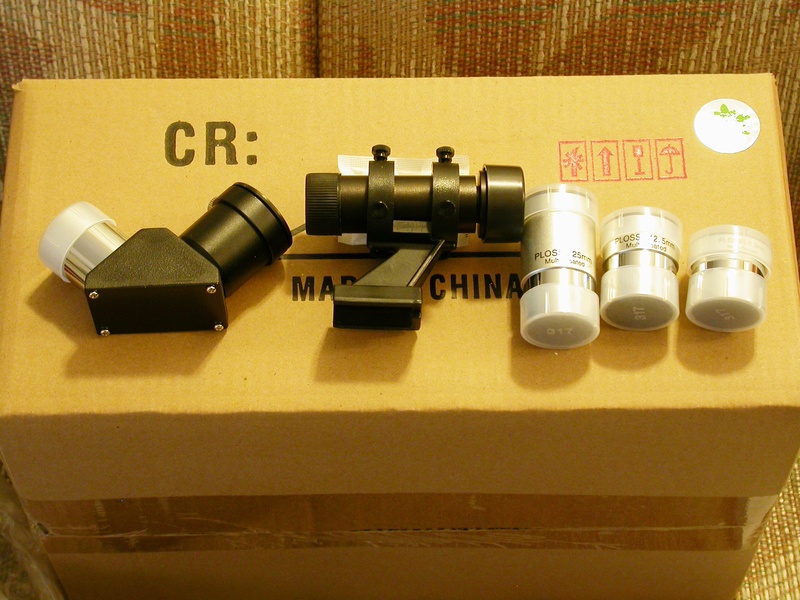 Pictures of the assembled scope show the scope mating directly with the mount via its dovetail bar. The L-bar allows one to mount the scope upright instead of on its side, or to mount other devices with 1/4-20 mounting bolts, like cameras, binocular mounts, and other sport optics. Some thought went into the other accessories, too: there are a couple strips of sticky-backed Velcro so you can hang the hand controller on the side arm of the mount. Everything set up, with an ink pen and the spare eyepieces (1.25″ barrel diameter) for scale. Note the leveling bubble on the mount. I was pleasantly surprised by the tabletop base. It looks plastic-y in pictures but it’s a nice big piece of aluminum with big rubber feet at the corners and a knurled hand-knob underneath for turning the 3/8″ bolt that goes into the bottom of the mount itself. That means the mount can go on any platform with a 3/8″ bolt, which includes most of the better photographic and surveyors’ tripods. I had little time this afternoon and didn’t want to mess around with putting batteries in the mount and learning how to use it, so I put the scope on the Manfrotto CXPRO4 I use for museum photography and birding. This hall-of-mirrors shot is a typical view down the guts of a Mak. 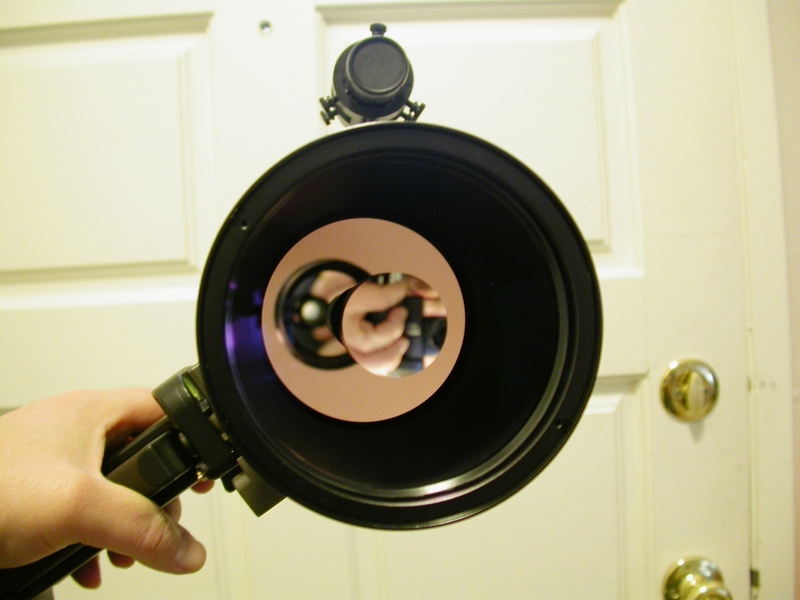 Incoming light passes through the meniscus corrector plate up front, bounces off the primary mirror at the back of the tube, then off the secondary mirror–not a separate piece of glass but an aluminized spot on the back of the corrector–then through a hole in the center of the primary mirror, then either straight into the eyepiece or, more commonly, off a mirror or through a prism that bends the light path by 45 to 90 degrees so you can look down to observe instead of crouching behind the tube to peer through it. The white dot farthest in is my ceiling light coming down through the translucent dust cover on the vertically-facing eyepiece. If you got lost among all of those reflections, no worries–see the ray-tracing diagram for a Gregory Maksutov here. Outside, ready to go. Note the purplish color of the meniscus, caused by the magnesium flouride anti-reflection coatings. On refractors, the best fully multi-coated lenses look like dark-green holes, they just swallow incoming light like you wouldn’t believe. From what I’ve seen and read, catadioptric scopes like Maks tend to have correctors that are almost invisible if they have top-of-the-line coatings. This less well coated corrector shows some reflections, but in truth the difference is slight, just a few percent of the total incoming light. To see some photos of the correctors on other 90mm Maks, including a Questar, see Ed Ting’s 3-way comparo here. I was all set up to take some pictures of the male hummingbird who sits in the top of our neighbor’s tree, but the little sod must be psychic. Every time I got the camera settings right and the camera to the eyepiece, he’d fly away. My time was limited and eventually I had to give up and go do other things. You can see some birding photos I got through my old Orion 90mm Mak, including what might be the same hummingbird, here. I knew from the online UPS package tracker that the scope was coming today. For the past week, Weather Underground was predicting clear skies tonight. But sure enough, the New Scope Curse struck, and about sunset the sky went from a few scattered clouds to completely socked in. So the only views I got through the scope today were of a distant treetop to get the finder aligned, and a few seconds’ observation of that rotten hummingbird. Everything looked good and I didn’t see any obvious problems, but starlight will be the real test, as it is for any scope. Not tonight, unfortunately! The scope is real purty. Fit and finish are very nice. Mechanics seem good. Focusing is smooth with no detectable backlash, at least at the low magnifications I was using during the day. Stay tuned. Given my extremely limited time out with the scope, the optics seem fine. At 50x with the 25mm Plossl, I was counting scales on a tiny pollen cone in the top of a tall pine tree half a block away. I had no problem focusing directly to a crisp image, without having to flop around on either side of focus until I got it right–again, under the forgiving, low-mag conditions I was using it in today. No false color detected, but I haven’t really put it to the test yet. I haven’t used the supplied mount yet, but it gives a reassuring impression of solidity and has some nice touches I didn’t expect, like the built-in bubble level, included L-bar adapter, and Velcro strips for hanging the hand controller from the side arm. I’m disappointed that the diagonal has a prism rather than a mirror. Mirrors tend to be much sharper, especially at the high magnifications Maks are capable of delivering. Now, most Mak spotting scopes come with 45-degree prism diagonals so this one isn’t behind the curve, it just seems weird that essentially all Mak-makers (Questar excepted, obviously) hobble their scopes as shipped with inferior diagonals. I knew this coming in, but the supplied finder is tiny, and uncomfortable to use since I have to crouch behind it. Unfortunately I don’t have the 6×30 RACI anymore that I used to use with my little Maks. For review purposes I will use the supplied finder, but when it’s just me using the scope for pleasure I am either going to have to move the 9×50 over from one of my bigger scopes or buy another optical finderscope (or, just maybe, see if I can get along with dead-reckoning using a spare red-dot finder I have laying around). Also, the finder bracket is not one of the convenient two-bolts-and-a-spring models but an old-fashioned six-screw job, which means that getting the finder aligned takes about 5 times as long as I’m used to. The choice of eyepieces is odd, because each one is a factor of two away from another one. One of the most common astronomical accessories is a 2x Barlow lens, which effectively halves the focal length of any eyepiece. Eyepieces are often sold in staggered pairs to take advantage of this. For example, my first scope came with 25mm and 10mm Plossls, which when Barlowed gave me four focal lengths to choose from: 25mm, 12.5mm, 10mm, and 5mm. If they were similarly staggered, the three eyepieces included with this scope could have yielded six magnifications when Barlowed. Instead, they give just four: 25mm, 12.5mm (both natively and with the 25mm Barlowed), 6.3mm (both natively and with the 12.5mm Barlowed), and 3.2mm. So the 12.5mm eyepiece is superfluous if you have a Barlow. On the other hand, this bundle is clearly aiming for everything-a-beginner-needs-in-one-box completeness, and if you don’t have a Barlow yet, having three eyepieces is very convenient. 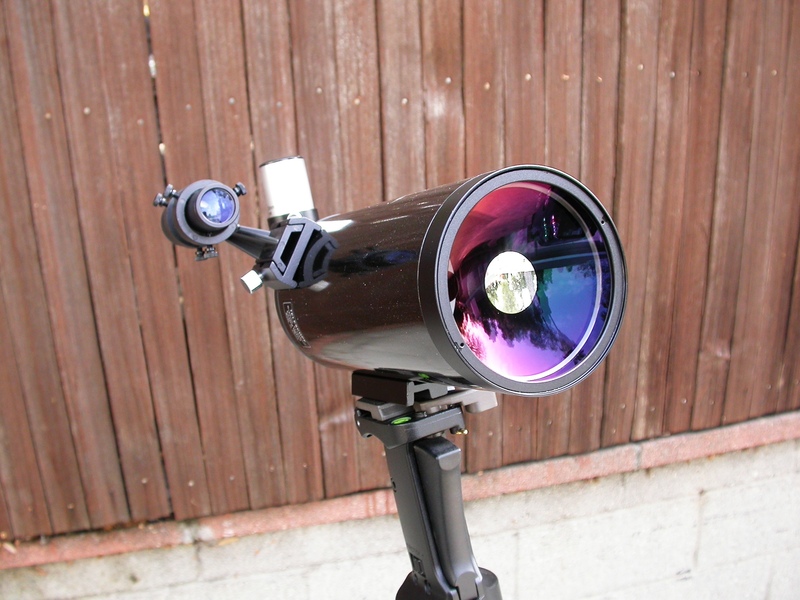 Most other Maks come with just one (although some C90 packages come with two); advantage SkyWatcher. The optics are coated rather than multi-coated or fully multi-coated. I haven’t had a chance to see if this makes a detectable difference at the eyepiece. It only strikes me as odd because I have seen so many affordable Chinese-made scopes that are multi-coated that I had started to assume that was the new baseline. I see that I went on at much greater length about the nots than the hots. Don’t read too much into that, it’s mostly whinging about accessories which are just as good as or better than those shipped with most other 90mm Maks. The only criticism that applies to the scope itself has to do with a level of lens coating that may not make much difference in actual practice. Remember that these are all first impressions; I have not yet had the scope out under the stars. Until I have done that and reported back, take this post for what it is: a list of parts. Ah, it’s always fun to watch these unboxing and you get to see so much more of what the thing actually looks like than you do from the single stock photo on the vendor sites. One handsome little instrument. I am hoping for clear SoCal skies tonight so you can put it to the test. I am seriously thinking of buying either this one, or the C90 as a complement to my StarBlast6. Yes, your NOTS section was a lot longer which initially concerned me but then, as you point out, your only real issue was with the coating and this seems to be not all that significant. But your first light test will let you (and us) know. 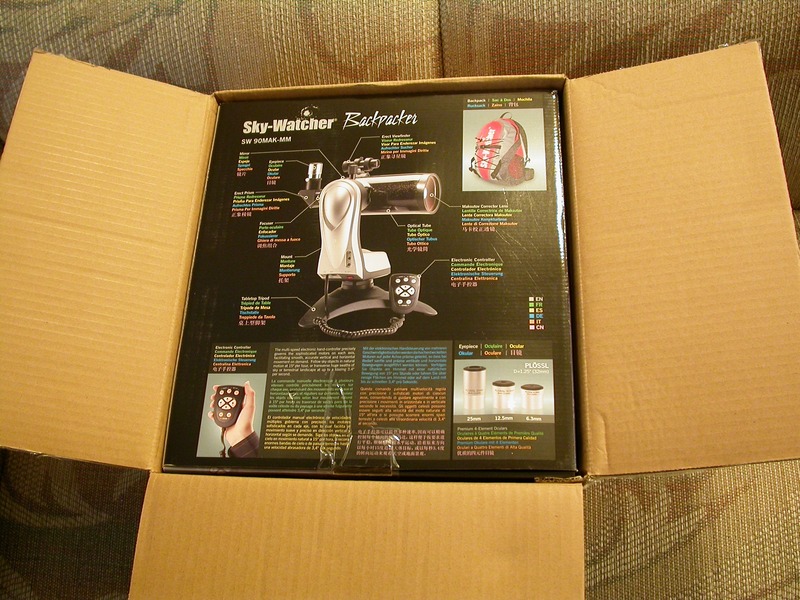 A highly-rated seller on EBay has this scope for the same $179 as Amazon (http://www.ebay.com/itm/250927019956?ssPageName=STRK:MEWAX:IT&_trksid=p3984.m1438.l2649#ht_2813wt_1398) but with free shipping. Still, if I decide to order one, I am going to spend the extra 20 bucks just in case as Amazon is outstanding when it comes to returns. Looking forward to your first light report. Never seen a finder where six screws are needed to attach it to the bracket (?!). The Celestron C90 also has a small 8×21 finderscope, but with three bolt screws, no spring. Hopefully, the “coating” issue won’t make a difference in the views. Hoping your scope comes with superb optics! I’m going to test my C90 Mak on the planets tonight – looking forward to it! Ah, Dueling Maks! C90 vs. StarWatcher backpacker mano a mano. Can’t wait to see both observing reports. Matt, I watched a new C90 unboxing video on YouTube and it looked like a cool little scope, too. A bit chunkier-looking than the StarWatcher 90 but not by much. And with a 45-degree diagonal vs the 90 degree on yours. What I did notice, and it instantly called to mind one of your comments re coatings, was that when the poster removed the lens cap and was moving the scope around facing the camera, there was a definite blue-green reflection visible vs. the purplish hue on yours; evidence, I am guessing, of the superior coatings of the C90? But, as you say, in actual practice it may not be a difference at all. Well, that’s just it, isn’t it? Clearly Terry and I need to get together and try the scopes out side-by-side so we can make a genuine comparison, like Ed Ting did in his three-way Mak comparo. Things like the relative brightness difference Ed found between the three scopes will only come out in a head-to-head test like that. Plus, Terry and I have kicked around the idea of getting together to observe anyway, and this would be a great excuse to finally make it happen. Terry, what do you think? Absolutely – I’m very busy this month, but I might be able to squeeze in a Saturday night later in the month depending on how much work I get done before I leave for vacation in April. The Santa Monica Amateur Astronomy Club meetings conflict with the PVAA meetings (2nd Friday of each month), although I skipped the last meeting to check out your club meeting last month. Joshua Roth, a well-known small scope enthusiast, was a member for a long time before he moved to Boston. I joined the club only in the beginning of last year, so I’ve never met him. I tried the C90 Mak on my Orion Skyscanner tabletop mount attached to a Manfrotto tripod. The mount and tripod seemed to support the C90 well, even though the Mak (5 lbs.) is heavier than the Skyscanner (3.4 lbs.) and the Starmax 90 (3.7 lbs.) OTA. 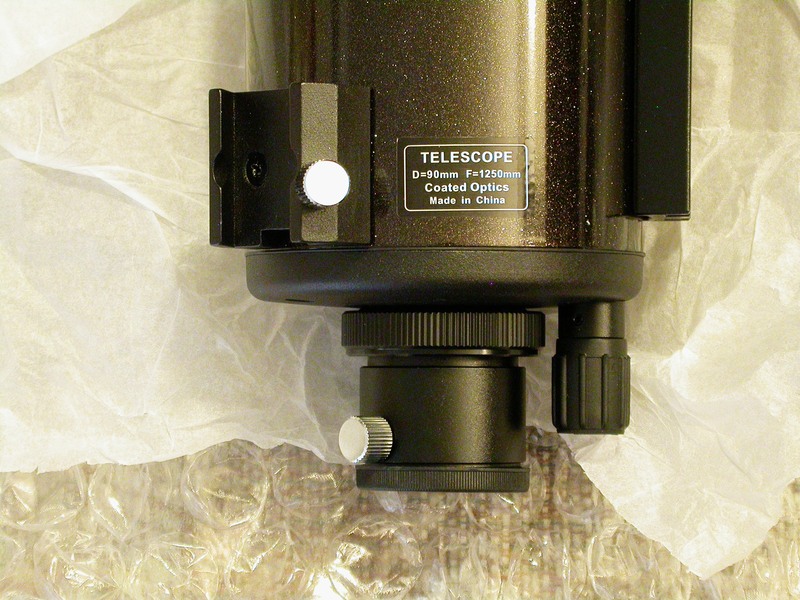 The scope was also able to clear the base of the mount when pointing at the zenith. Obviously I would rather use this tripod/mount combo on this scope for portability’s sake rather than the VersaGo II alt-az, although the latter seems to provide steadier views. Tonight I will see how this mount/tripod combo performs on the Mak on a windy evening. Will be comparing the views with the Skyscanner on DSO’s as well (in terms of detecting faint fuzzies). Went to Malibu last night with my C90 Mak and the Orion Skyscanner with a friend (he brought along his Skyscanner along with a 6-inch Newtonian). I started off observing with my shorter focus Skyscanner as it was too windy initially to use my higher power Mak, but got so comfortable with it that the C90 never left its backpack last night, even when the wind died down. So my test performance of the C90 on DSO’s will have to wait, probably when the moon reaches the last quarter. On a side note, there were two Skyscanners side by side last night, which could have made for an interesting shootout, Although we sought out different DSO targets, we did make a play for the fainter member of the Leo Trio (NGC 3628) at the same time. Despite considerable moon glow from a waxing gibbous moon interfering with our observing, we both managed to see the more elusive third member with our scopes as Leo reached the zenith. Tim, I can do better than rough dimensions, since the box is still in my garage (I always keep boxes for a few weeks just in case I need to return things). The outer shipping box is 17x15x11 inches. Terry, catching the third member of the Leo Trio through the light of the gibbous moon is quite an achievement in any scope. Good work! Thank you, that was very kind. 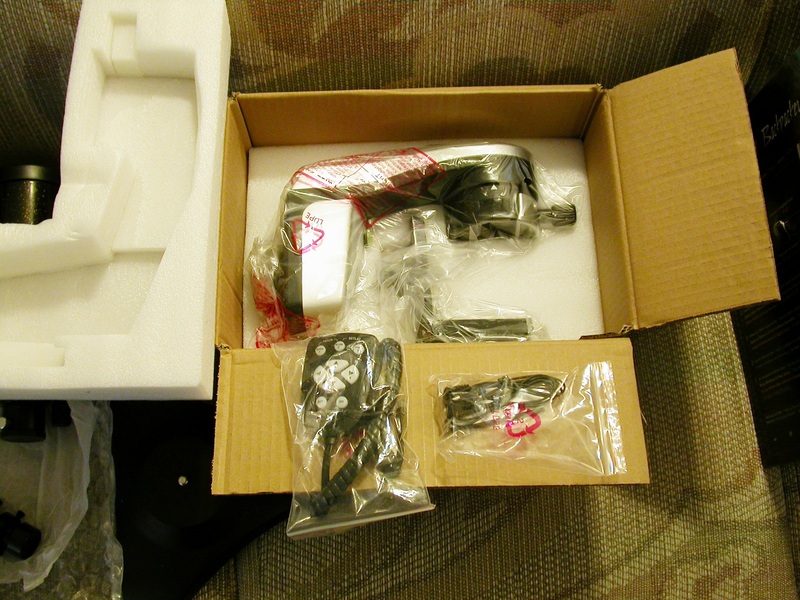 I’m off now to set up the US PO box forwarding service … why do Celestron have to make it so hard ? I would like to see an unboxing sequence for the C90. It’s really hard to get a sense of what a scope really looks like for the single stock photo Amazon usually provides. I agree that an unboxing sequence for the C90 would be useful, but if you just want to see the scope from other angles, check out Ed Ting’s 3-way Mak comparo and his C90 review. Actually, check them out anyway–he might sell you on the C90! I read the Ed Ting 3 scope shootout a couple of weeks ago and, yes, he makes a compelling case for the C90 which holds its own with the mythic Questar and for about 1/20th the cost. The C90 is definitely on my Mak short list, though the Skywatcher, assuming manual control works well, has the big advantage of coming with a nice tabletop mount. It seems that perhaps the C90s optics are somewhat superior, but as Matt suggests, the difference would not likely be significant.